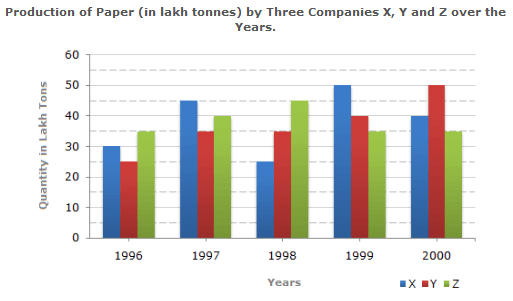 The bar graph given below shows the data of the production of paper (in lakh tonnes = One Lakh is equal to One Hundred Thousand (100,000)) by three different companies X, Y and Z over the years. For which of the following years, the percentage rise/fall in production from the previous year is the maximum for Company Y? 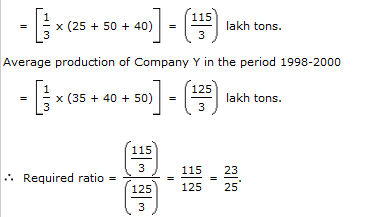 What is the ratio of the average production of Company X in the period 1998-2000 to the average production of Company Y in the same period? The average production for five years was maximum for which company? In which year was the percentage of production of Company Z to the production of Company Y the maximum? 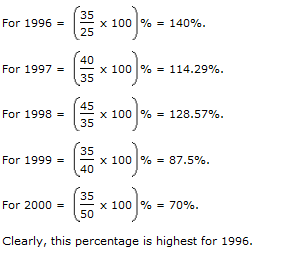 What is the percentage increase in the production of Company Y from 1996 to 1999? What is the difference between the production of Company Z in 1998 and Company Y in 1996?